Display includes former NHLer Jim Neilson's Sagkeeng jersey, as well as Verna Fontaine's banner of hockey pins she collected during team's travels. An Indigenous men’s hockey team has once again been placed on the international hockey map. That’s because several items from the Manitoba-based Sagkeeng Oldtimers are now on display at Toronto’s Hockey Hall of Fame. The donated items being showcased were revealed at a press conference at the hall of fame on Tuesday. The Sagkeeng Oldtimers, featuring Indigenous players ages 35 and over, was a team comprised mostly of residential school survivors. The squad was formed in 1978 and competed in numerous games and tournaments not only throughout Canada and the United States but in Europe as well. Among those who attended Tuesday’s press conference was Darlene Ahmo. Her father Walter Fontaine was not only the founder but a player and a coach for the Sagkeeng club. And her mother Verna was the team’s manager and was instrumental in its fundraising, which included numerous charity bingo nights. “After my dad died in 2000 the team kind of fell apart,” Ahmo said. Verna Fontaine died in 1989. The following year she was inducted into the then-named Canadian Oldtimers Hockey Association’s Hall of Fame via the Builder category. She was not only the first Indigenous person, but also the first woman to be inducted into this hall. 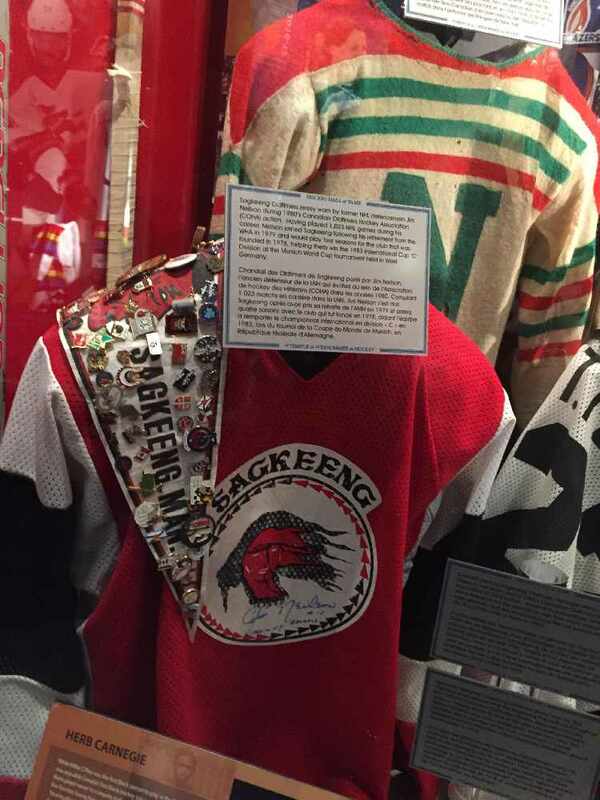 The inclusion of Sagkeeng Oldtimers items in the Hockey Hall of Fame is due in part to one of the Truth and Reconciliation Commission's calls to action. That would be the call for sports halls of fame to include public education on the stories of Indigenous athletes. Ahmo, 64, is thrilled people are now once again talking about the Oldtimers, club which disbanded almost two decades ago. Ahmo’s son Josh also attended Tuesday’s press conference. “I’m still processing all of this,” he said. Though he never played hockey – football was his preferred sport – Josh Ahmo said he’s fully aware that anybody who ever played hockey aspired to either win a Stanley Cup or end up in the sport’s hall of fame. “To see someone in your family achieve one of the highest honours in your sport is surreal,” he said. The Ahmos donated about 50 items to the hall of fame. For starters, a new acquisitions display near the entrance to the hall includes Walter Fontaine’s Sagkeeng jersey and a hockey bag with the Sagkeeng Oldtimers’ crest. Then, in the hall’s diversity hockey section, there are four items, including Verna Fontaine’s cowbell, which helped her cheer on the squad. Verna Fontaine's cowbell Photos courtesy of Darlene Ahmo. Other items on display now are jerseys worn by former National Hockey League defenceman Jim Neilson, who suited up for the Sagkeeng side after his pro days concluded. Another jersey worn by Darlene Ahmo’s cousin Ted Fontaine is also on display. And so too is a banner that Verna Fontaine created to display the estimated 50 pins she collected during the team’s extensive travels. The Sagkeeng Oldtimers had plenty of success at a number of tournaments. For example, the club captured its division at the World Cup in 1983 in Munich, Germany. The team also brought home some championships in 1987 from tournaments staged in Montreal. The Sagkeeng club not only won a national crown that year but it also returned with another World Cup title. Besides the Ahmos, the Sagkeeng contingent at Tuesday’s press conference included five former players from the Oldtimers team. They were Ted Fontaine, Fred Kelly, Ronald Guymond, Ken Young and Willie Littlechild, the Grand Chief of the Treaty 6 First Nations and a commissioner of the Truth and Reconciliation Commission. Kelly Masse, the director of corporate and media relations for the hall of fame, was pleased to attend Tuesday’s conference and learn about the Sagkeeng Oldtimers. “It was an education for me as well to talk to them about this team,” she said. Masse said the Sagkeeng items currently on display will remain out for six months. Hall officials frequently rotate their displays. “It doesn’t mean though that these items will not be coming out again in one of our displays,” she said. Masse added the hall has an outreach program and hall representatives take items they deem of interest when they travel to events throughout the world.